It's quick, secure and simple to order. We offer a very personalised service from our offices and we will keep you informed at every stage right up to tracking information from DPD Express and DHL our preferred couriers. National post may be used for some addresses. Delivery times vary by season and demand - our product is handmade so capacity is limited. Orders placed this week will be delivered within 3 to 5 weeks. You will be given an estimated delivery date when you choose your style and you will receive updates by email until delivery. We design the boots and manage the process from our offices. The boots are handmade to your measurements in our family owned workshops in Portugal using the finest leathers sourced from Italy. We have several styles available in black, brown and grey patents - they come in snake or mock croc finishes. Good quality footwear should be leather lined. Whist it costs more to make boots with leather linings there is no substitute for the natural breathability and the way a separate leather lining feels on your leg. All our boots except the fur lined styles are leather lined. 2 pairs Bespoke = Double Deal. If you order 2 pairs of our Bespoke styles, save at least 10% or more on each pair. As ever you can team up with a friend as long as we deliver to the same address. During the summer holidays our workshop will be closed in August. All orders received in July and August will be prepared for production. Productions will start first week of September. First deliveries will follow in the last week of September. Uniquely we make your boots to your calf, ankle and height measurements. This fabulous service is complemented by a choice of over 20 fashionable styles and our unrivalled range of colours, leathers, suedes and trendy patents. Your perfectly fitting boots will be delivered to your door in just a few weeks at a price comparable to or less than similar quality off the shelf brands, so why compromise. Choose your style and specify your measurements in just a few clicks. As standard most styles are available in sizes as slim as 26 cms calf, all styles are available up to 40 cms calf and some 52 cms and beyond. Ankles can be specified from 23 to 36 cms depending on style. Measuring is simple, view our guide. For sizes outside these ranges or if your feet or legs are different sizes we can still make you a wide choice of fabulous boots email us for a quotation. We have been delighted by the enthusiastic response since we started delivering our boots in September 2010, take a look at customer feedback. An astonishing number of our customers have already come back for more, many have had four, five and even six pairs taking advantage of our wide choice of styles and colours. Many customers have taken time to post their comments on independent review sites such as The Review Centre and Yelp. Our Bespoke made boots are incredible value for money, each pair is handcrafted to individual order for a price less than high street brands of similar quality. We are able to make pairs to different foot sizes and calf measurements as well as larger calf sizes. If you have any specific requirements or enquiries just email, we will always reply, contact us at any time we are here 24/7. Many of our customers are in Australia, New Zealand, South Africa, the USA and Canada. If you are ordering from these countries take a look at information on saving 20% UK VAT and Exchange Rates. Save at least £50 or more!!! For bargain hunters we have a very limited number of boots available for immediate delivery. You can save at least £50 on our Bespoke prices and have your boots in just a few days. These boots have been hand crafted to the same exacting standards as our Bespoke product. Stock is limited, one pair of each size shown, so if you see a pair in your size go for it! 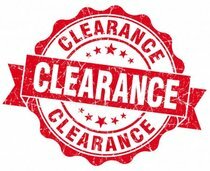 We usually achieve next day dispatch view Clearance Stock.